Our advice and information drop-in can help with a wide range of issues and problems so just walk through the yellow door and let us know how we can help you. Monday to Friday, 10 a.m. to 5 p.m. The C-Card (condom card) is a small card which will fit into your pocket, wallet or purse. Having a card means that you can get free condoms from CYP’s drop-in and other collection points. Both young men and women can get a c-card but you must be between the ages of 13 and 25. To a get a C-Card from CYP come to our Advice and Information Drop-in. One of our workers who will explain the C-Card to you and discuss some sexual health issues. You will need to give your date of birth and postcode (We will never contact you using this information.) We give you a C-Card and selection pack of condoms. You can use the C-Card to get your condoms from CYP’s Advice and Information drop-in and other collection points which will display C-Card logo. You will need to tick on the C-Card which type of condom you want and hand this to a member of staff at any collection point displaying the window sticker. You do not need to give your name or any other personal details to the person at the collection point. Your C-Card will be given back to you with the date of the visit marked on it. The service is confidential and the person at the collection point will not discuss your visit with anybody else. When the card is full you will need to go back to come back to CYP Drop-in or another C-Card Assessor and get a new C-Card. It would be good for you to go to the same person who gave you the card in the first place but you can go and see someone else if you prefer. Friday 2 p.m. to 5 p.m. is the drop-in for sexual health and c-cards. You can also get top-ups and assessments at Youth Café and the Youth Bus. Mentoring in CYP advice and information drop-in is one to one ongoing support tailored to each individual with the aim of supporting you to reach your goals. Sessions can range from writing CVs to helping you gain employment or improve your social skills and confidence. Wednesday 2 p.m. to 5 p.m. is the drop-in for Mentoring and Social Skills. or call for a one to one appointment. The CYP advice and information drop-in is not a food bank but we can provide you with a food parcels if your benefits are delayed, stopped or reduced or for some other reason you are struggling to make ends meet. We do not have a referral process just come in and let us know what you need. You are very welcome to visit CYP advice and information drop-In to use our phone and access the internet in order to help you look for work, sort out bills, talk to the DWP etc. If you need help talking to someone in authority we will be happy to speak to them for you, just come and see us at the CYP advice and information drop-in. Staff in our advice and information drop-in can help you write your CV, sharpen an existing CV, help you with interviewing technique, build your confidence. The Job Clubs at the Drop-in are on Wednesday morning 10 a.m. to 1 p.m. and Thursday Morning 10 a.m. to 1 p.m.
Budgeting involves keeping track of how much money you receive and how much you are spending. It can help you prioritise important things and cut back on others. It also helps you plan for the future. A good budget plan can stop you getting into debt. The workers in our advice and information drop-in can help you to draw up a budget and support you in developing other money management skills, maximising your income and helping you reduce expenditure. Parent Support is offered at the Yellow Door Youth Hub 10 a.m. to 1 p.m. on a Tuesday morning. Our workers can offer advice and support on a range of issues and problems. Come in and have a chat. Our advice and information drop-in workers can give you one-on-one support to help you connect with the learning, training and work opportunities. In the drop-in you can access the internet for job searches, receive mentoring to set goals and discuss your ambitions, you can develop a CV and hone your interview skills. Our workers can also offer support and advice to help find the right career for you. The Job Clubs at the Drop-in are on Wednesday morning 10 a.m. to 2 p.m. and Thursday Morning 10 a.m. to 1 p.m. The Careers advice and support drop-in are on Thursday 2 p.m. to 4 p.m.
We do not provide accommodation but our drop-in workers can support you through the whole process of obtaining accommodation or sustaining your existing housing. Our workers can help explain your situation to housing services and providers, when possible helping you remain in your property, supporting you to negotiate and pay rent arrears, deal with disrepair issues and supporting you with the eviction process. They can also help you explore different housing options, explain your housing rights, look for accommodation in the private rented sector, negotiate with landlords, help you claim benefits and make referrals to specialist housing schemes. Finally, when you find accommodation our workers can advise on your rights and responsibilities and help you with the life skills needed to sustained your tenancy. The housing advice drop-in is on Monday morning 10 a.m. to 1 p.m.
We can provide you with friendly and expert advice on drugs and alcohol. We can help you to understand the effects of using drugs and/or alcohol and support you to reduce your use if that is what you want. If a member of your family, parent or carer is abusing drugs or alcohol we can offer you help to understand and cope with their addiction. Our services are completely confidential and we will never share what you tell us without asking your permission first. That means you can tell us things without worrying about getting into trouble with your family, your school or other people. As well as one-to-one work, we offer a range of early intervention programmes in schools, youth clubs and helping young people to make informed and safer choices. Advice and support with drugs and alcohol is Monday 1 p.m. to 5 p.m. or call and ask for Lindsey. Canvey Youth Project provides counselling in a confidential, non-judgemental setting. We offer weekly sessions where you can talk to your counsellor about what is on your mind and explore the difficulties you are experiencing. Each session lasts for 50 minutes. Counselling offers you the opportunity to discover more about yourself, explore different ways of looking at your life and enables you to find ways of coping. Benefits can be complicated and hard to understand, our advice and information workers can help you find out which benefits and how much you are entitled to. They can help you apply for them including helping you complete forms both on paper and online. They can speak to the benefits agencies on your behalf and help you with appeals and medical assessments. The drop-in for benefits advice and support is on Friday 10 a.m. to 5 p.m. It doesn’t matter what is bothering you, Relationship issues, domestic abuse, family problems, debt, poverty…….. our drop-in workers are here to listen and support you. Come through the yellow door and let us know how we can help. Our Emotional and Behavioural Support Service can offer you non-judgemental one to one weekly sessions where you can talk through any problems and help build your confidence and social skills. Next Level is Canvey Youth Project performing arts group. We meet on Mondays between 6.30 p.m. and 8 p.m. at Yellow Door Youth Hub, Poplar Road, Canvey, SS8 7BN. during term time. Learn to sing, dance and act whilst you have fun and develop your confidence. The group is for young people between 13 and 18 and is Free. Arts and Craft Group for young people 11 to 18 Wednesday between 6 p.m. to 8.30 p.m. (Term Time) at Yellow Door Youth Hub, Poplar Road, Canvey, SS8 7BN. All kinds of Arts and Craft, painting, craft work, sculpture, your art your choice. Youth Café for young people 11 to 18 open Fridays between 6 p.m. to 9 p.m. and Saturdays between 1 p.m. and 6 p.m. The Youth Café is somewhere you can relax and socialise. In addition to selling drinks and snacks, there are also various activities on offer including pool table, games, and PlayStation. Youth Bus at Waterside Skate Park, we take the Essex Youth Bus down to Waterside Skate Park, Somme’s Avenue, Canvey, every Tuesday between 4 p.m. and 6.30 p.m. If you are between 11 and 18, you can come on board for a drink and chat, play the play station and take part in activities. Stress Busters is a 10 week course to help you find out what makes you stressed and how to deal with it. At the end of the 10 weeks you will have your own pack of stress busters ideas that could work for you. This next course starts Thursday 24th January 2019 4 p.m. to 5 p.m. at Yellow Door Youth Hub and will be for young people 14 to 16. To book a place call 01268 683431 or email linda@canveyislandyouthproject.org.uk. Yellow Door offers Counselling in Schools for a range of problems including family issues, bereavement, health, emotional issues, behavioural problems, and relationship issues. They are 50-minute sessions once a week. Our Counselling is delivered by a qualified BACP accredited Counsellors. 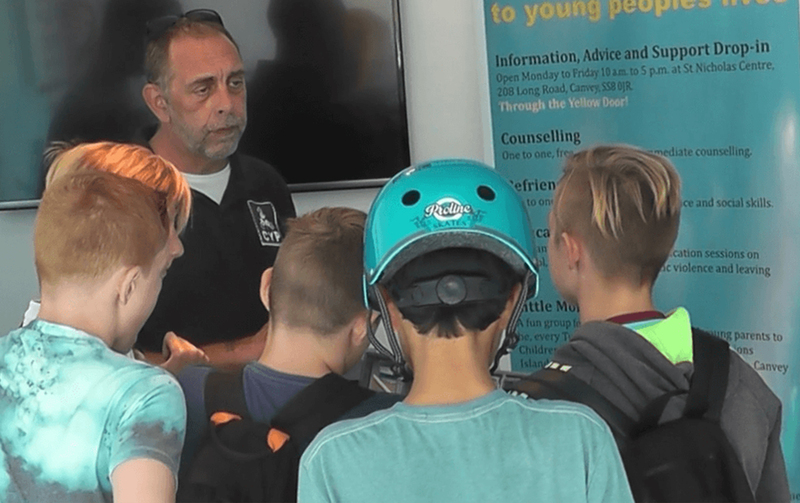 For the past 10 years, Canvey Youth Project has been delivering effective education on alcohol and drugs in Schools, Colleges and Youth Groups. CYP workshops develop pupils’ knowledge, skills, attitudes and understanding about all drugs and alcohol. As part of your PSHE program, these workshops can help deliver quality drugs and alcohol education to children and young people with the aim of reducing the risks and harm associated them. Canvey Youth Project can also offer one to one advice, support and counselling and targeted advice and support to smaller groups of children and young people who may already be misusing alcohol and drugs helping to minimize harm and reduce consumption. Training can also be offered to increase Teachers and Youth Leaders knowledge.